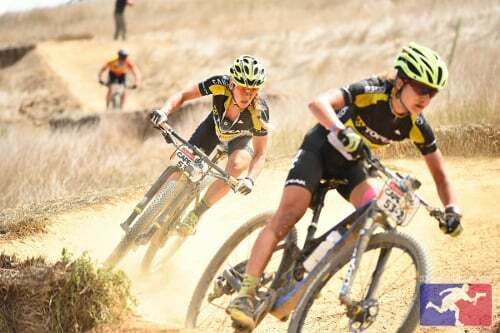 After racing 800km and climbing 15,000 metres on the beautiful trails of the Western Cape, South Africa, TORQ Fuelled Sally Bigham and team mate, Adelheid Morath (GER), crossed the finish line at the stunning Meerendal Wine Estate on Sunday. Lining up for the Prologue, I was excited to be side-by-side with Adel – my winning team mate from last year’s Swiss Epic – but I was all too aware that over the following 8 days there would be many unexpected challenges to overcome. While I’d already started 6 Cape Epics, I’d failed to complete 2 when my partners were struck by illness and heat exhaustion. In my mind I wanted to make sure that this race contributed to my ‘completed’ tally rather than my list of ‘DNFs’, but more than that, I wanted to win! The Prologue was fast and furious with us finishing less than one second off the Podium and just 1 minute behind the stage winners (Ascendis Health’s Jennie Stenerhag and Robin de Groot). We were happy and excited to begin the next 7 long, hard days in the saddle. In addition to the separate starts, the new race rules stipulate that drafting amongst the different categories (i.e. women and men) is prohibited, thereby making the race a fair fight amongst the women – a rule that I wholeheartedly welcome and one that continues to raise the level of professionalism. Stage 1 (108km) saw us lose 5 minutes to the race leaders – though we did move up to 3rd in the General Classification (GC) – so on Stage 2 (93km) we were determined to claw back some time with a strong performance. In the final 10kms we saw our stage win disintegrate when we were caught and passed by Spur Specialised (Ariane Kleinhans and Annika Langvad). During our chase along the fast district roads, the backdraft of a low flying helicopter blew Adel off her bike. At the time we were frustrated by the seconds lost, but it would later become apparent that this crash caused more damage than we initially thought. We finished the stage in 2nd position just 45 seconds off the stage win (3rd overall in the GC). 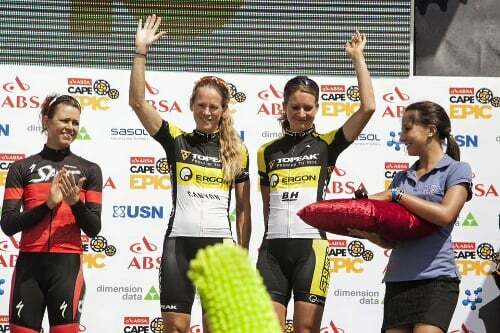 Stage 3 (104km) was a long transition stage which saw the 4 top women’s teams stay together until the final 15kms. It was thrilling from start to finish and the final 7kms were caught live on TV. Adel and I were able to make a break on the final climb and finally a stage win was in sight for us, but during the last few flat kms the intense heat and exhaustion meant Adel was running on empty and Spur Specialised beat us to the line by 30 seconds. Sadly, Team Ascendis Health was forced to withdraw from the race due to health issues. As a result we moved up to 2nd in the GC. Stage 4 (75km) took us on a tour of the finest singletracks of Welvernpass with kms and kms of switchbacks, twists, turns, rocks and drops. It was now however, that the earlier helicopter incident really impacted on our race. Adel’s knee injury was becoming increasingly painful and every pedal stroke was starting to hurt. We lost a further 5 minutes on the race leaders, Spur Specialised, putting us 12 minutes behind overall and 2nd in the GC with a 7minute lead over 3rd position in the GC. 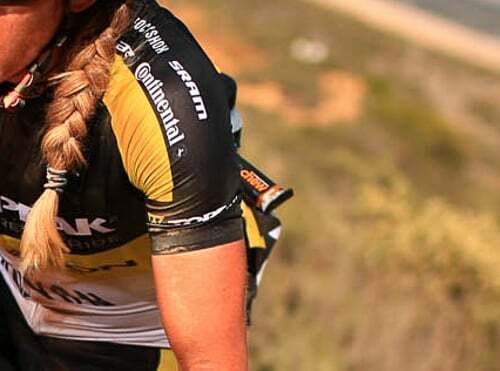 Stage 5 (93km) was a transition stage from Wellington to Boschendal and once again saw the top three women’s teams race closely together until the final 10kms. Exiting the final technical descent together, it was full speed along flat district roads and farm land to the finish line. Adel’s knee pain was especially troublesome and she battled to keep contact. After giving it everything we finished in 3rd position, but retaining 2nd position in the GC. Team Sport for Good (Sabine Spitz and Yana Belomoina) won their first stage with race leaders, Spur Specialised, 50 seconds ahead overall. 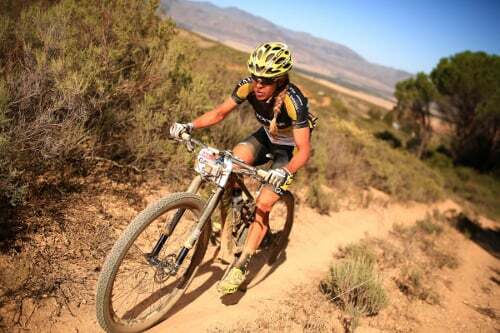 Stage 6 (69km) was, in my opinion, the best stage I’ve ever raced in the Cape Epic. The route covered kms and kms of world class singletrack twisting and turning through forests and traversing mountainsides. The steep climbs exacerbated Adel’s knee pain which ultimately caused us to drop down in to 3rd position in the GC when Sport for Good stormed to another stage victory. Stage 7 (86km) was the final stage, taking us from Boschedal and back to Meerendal. Once again the top 3 teams remained together until the final few kms. Nursing her knee, Adel gave 100%, which saw us finish 3rd in the stage and 3rd overall. After 33 hours and 30 minutes Spur Specialised won, closely followed by Sport for Good (+15minutes) and Adel and me (+20minutes). Although my dream of once again winning the Cape Epic wasn’t realised, I was thrilled to be part of the most closely fought women’s race in the history of the Cape Epic. Big congratulations to Spur Specialised on taking their 3rd Cape Epic win and Sport for Good for 2nd in their inaugural Cape Epic. Next year I will return fully motivated to once again fight for the overall victory – a victory which would add to my previous 2 wins (2011, 2012). As always, thank you so very much for your support! TORQ fuelled every km of my ride with Gels, Chews, Snaq Bars, carbohydrate drinks and TORQ Recovery shakes – specifically a TORQ Chew 5 minutes before the start; 2 x TORQ Gels, 2 x TORQ Chews, 1 x TORQ Snaq, 3 litres of TORQ Energy during each stage; and TORQ Strawberries and Cream Recovery shake immediately at the finish. All here at TORQ HQ send our congratulations to Sally and team-mate Adel!